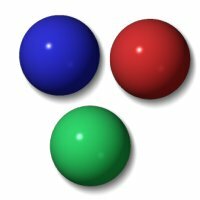 Marbles is a game that has been played for many years. There are lots of different ways to play the game. We'll describe the rules to one way to play below, but it's best if you make sure everyone understands the rules before you play, so there aren't any misunderstandings. One of the first things to make sure of is if you are playing "keepsies" or not. Most of the time all the marbles are given back to the originally owner at the end of the game, but sometimes players keep the marbles they win. You always need to state which way you are playing before a game begins. A circle is drawn on the ground, usually with a diameter of 3-6 feet. You can use chalk on the sidewalk or blacktop or use thread or string to make a circle on the carpet. Marbles are placed inside the circle, usually near the center and often arranged in an X pattern. To determine who goes first usually you draw a line around 10 feet away. Players shoot or roll their marble to see who can get the closest. The closest player goes first. The player uses their shooter marble to take a turn. To shoot the marble typically a player will use their thumb to flick the marble from their hand putting their "knuckles down" onto the ground. The goal of each shot is to hit one of the marbles in the center and knock it out of the circle. If the player knocks a marble out, then they get to keep the marble for the rest of the game, they also get to take another turn. If no marble is knocked out of the circle, the other player then gets a turn. The first shot must be taken from the edge of the circle. If the shooter stays inside the circle, then next shot can be taken from the spot where the shooter landed. The player with the most marbles at the end of the game is the winner. If a player knocks the other player's shooter from the circle, then the shooter wins all the player's marbles they have won so far and that player is out of the game. You can choose to play where the shooter marble is removed from the circle at the end of each turn. Taw - shooter marble. It's usually a heavier marble than the ones in the center so it can knock them out of the circle. Mibs or Kimmies - the marbles in the center of the circle. Friendlies - games where the marbles are returned to the original owner at the end. Bombing - when marbles are dropped onto other marbles rather than shot. Lagging - shooting or rolling the marble to a line to determine who gets to go first.